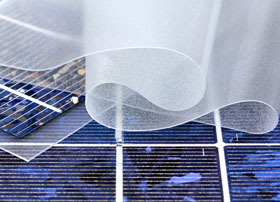 Munich, September 25, 2012 – A thermoplastic encapsulant from WACKER, the Munich-based chemicals group, prevents undesired solar-cell performance losses. This is the conclusion that the Photovoltaik-Institut Berlin arrived at after testing solar modules that had been encapsulated with the thermoplastic silicone elastomer TECTOSIL® on behalf of the chemical company. The testers confirmed that such modules do not display leakage currents due to potential-induced degradation. These effects can occur in the event of higher voltages and can lead to significant performance losses in the solar module. Potential-induced degradation (PID) is caused by undesired leakage currents on the cell surface. They cause negative charge carriers that would normally flow to the cell’s back contact to be discharged via the encapsulation and module frame, unused. Penetrating moisture and high module voltages promote this type of discharge, which can cause considerable performance losses. However, the PID effect is reversible and can be restricted through technical countermeasures. Measurements by the Photovoltaik-Institut Berlin now show that such PID effects can be effectively suppressed, or that they don’t even arise, with TECTOSIL® encapsulants. To this end, solar modules encapsulated with TECTOSIL® were tested as per IEC standard 60904-1 at a system voltage of 1,000 volts. Unlike the reference modules, which, in part, displayed PID effects, the Berlin testers could not ascertain any PID-related performance losses in the TECTOSIL® modules. The modules encapsulated with WACKER’s material showed no signs of PID, either in their voltage characteristics or during subsequent electroluminescence analysis. TECTOSIL® is a flexible, highly transparent and electrically insulating sheet comprising an organosilicone copolymer. Because of its thermoplastic properties, WACKER’s silicone-based polymer can be processed quickly and inexpensively – without curing or other chemical reactions. In the manufacture of solar modules, TECTOSIL® facilitates short cycle times and a high tolerance to local temperature differences within the laminator. TECTOSIL® bonds the components of a PV module into a stable laminate. Encapsulated solar cells are thus afforded optimum protection against mechanical and chemical stresses. The polymer also has the advantage of being chemically stable, which means there is no risk of clouding, yellowing or the like. The sheet does not contain catalysts or corrosive substances. This allows it to be used for encapsulating solar cells containing films of compound semiconductors or other highly sensitive chemical substances – such as transparent conductive oxides. Thanks to TECTOSIL®’s properties, modules can be produced with high quality and a long service life.